In just the right conditions, the kelp forest at Fogarty Creek is accessible to SCUBA divers from shore. There are not very many places in Oregon where divers can access kelp forests without a boat. The surf entrance can be tricky and conditions can change fast but if it you hit the beach at the right time, you can go dive some great kelp beds. We have not been able to dive this site yet due to unfavorable conditions when we have tried in the past but we have heard of others diving here and from everything we have observed, it looks like a good spot to check out when the seas are kind and calm. The main draw here is the kelp beds just off shore from Fogarty Creek. There are some interesting rock formations to check out, too. Someday otters will once again live here but for now, it will only be us SCUBA divers and a few other mammals visiting these kelp beds. Lincoln Beach is just north of Fogarty Creek and just to the south is Depoe Bay. Watch for the Fogarty Creek State Recreation Area signs on US101 north of Depoe Bay. There is plenty of parking at the state rec area. You will probably have to pay to park here but double-check the signs. The kelp forest at Fogarty Creek is shore-accessible in calm sea conditions. The kelp forest is split into two parts. The northern kelp forest is larger but a bit more of a surface swim to get to. The southern kelp forest is smaller and a shorter swim. There are some interesting rock formations near the southern kelp forest that can also be visited. One thing to remember here is that surf conditions need to be really good before you try diving at Fogarty Creek. There aren’t many beach surf entrances in Oregon and it is important to know how to do safe entrances and exits from the beach. We’re not your mom so make sure you know what you’re doing. You can enter or exit just about anywhere along the beach but doing your entrance/exit nearer to the area you want to dive is a good idea. However, you need to do an entrance and an exit where it is safe to do so. Surf conditions, current, undertow, and other conditions will dictate where it is best to enter/exit. If you don’t know how to do an army crawl out of the water, you should get instruction on how to do so. This is a shore dive although you can also access the site from a boat. If you wanted to, you could probably put in an inflatable raft with an engine here. We have not done this yet so be sure to double-check with the relevant state authorities before launching a boat from Fogarty Creek Beach. Normally the conditions are rotten here. Surf, surge, current, waves, undertow, and many other bad and nasty things are the norm here. On a rare calm day, you will have better conditions but there are still dangers here. Viz can be up to 30 feet here. Sometimes it’s even better. The summer upwelling can reduce visibility and right after a storm there will be worse viz. Depending on the time of year, you will see temperatures between 45 and 55F. There isn’t really a good time of year to dive here but in the summer and early fall, you have a better shot of having halfway decent conditions to dive Fogarty Creek Kelp Forest. This is a fairly shallow site which makes surge much worse here than other deeper kelp beds in Oregon. You can find 30 feet on the far west side of the kelp beds. Advanced open water training is a really good idea before diving this site. Rescue diver training is a good idea. Lots of practice and training in surf entrances and exits is needed here. This is an advanced dive. You need to know what you’re doing before you do a shore dive into the open ocean. 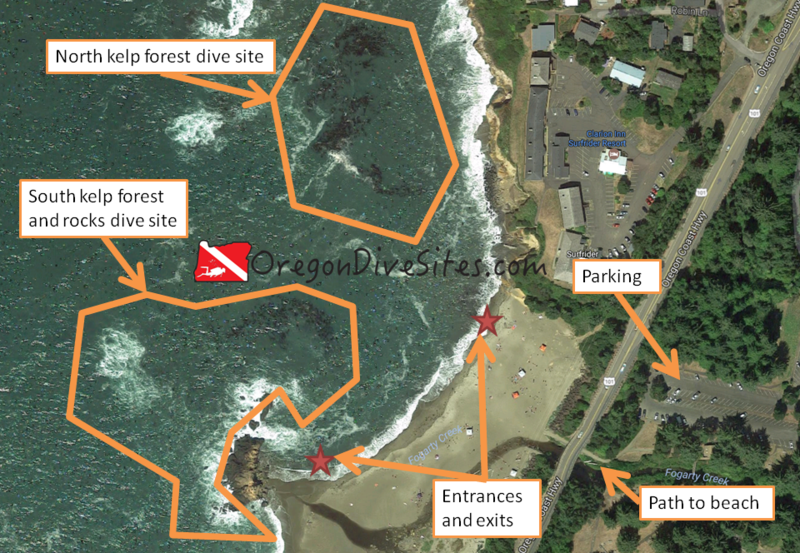 Even people with many dives on the Oregon coast can make mistakes here that can lead to being killed or even worse. Be sure you know what you’re doing and you’re comfortable with the conditions before you go diving. You will have between 500 and 1000 feet to walk to get to the entrance. A surface swim between 100 and 200 feet is a good idea to get into some deeper water. This site is dangerous in all but the best conditions. In even ideal conditions, the site is still dangerous. Take a safety sausage. Have a friend keep track of you from the surface. Be sure you have plenty of air in your tank in case you have to belly crawl out of the surf. There is an air fill station in Depoe Bay that you can get air at by appointment only. Otherwise you’ll need to go up to Astoria or in to Portland, Salem, or Eugene for a full service SCUBA shop. There is lots of good food on this part of the coast. Let us know what your favorite place is! There are several state campgrounds in the area as well as many hotels and vacation rentals. We haven’t tried any of the lodging outside of tent camping around here so please let us know if you have found a good hotel or house that welcomes divers.